Once a fairly routine procedure, applying for nursing home Medicaid has gotten much more difficult. Perhaps rising budget concerns and controlling Medicaid is the reason. Medicaid has always placed restrictions on the ability to transfer assets within a certain time prior to applying for benefits (currently five years, it used to be three years). And as part of that process, an applicant has always been required to state on the application whether any transfer has been made. As I tell my clients, Medicaid and Medicare fraud is a serious crime and you should NEVER intentionally lie or misstate a fact on the application. Also a traditional part of processing the Medicaid application by DSS was to spot-check financial records, particularly if the caseworker had questions or suspicions. 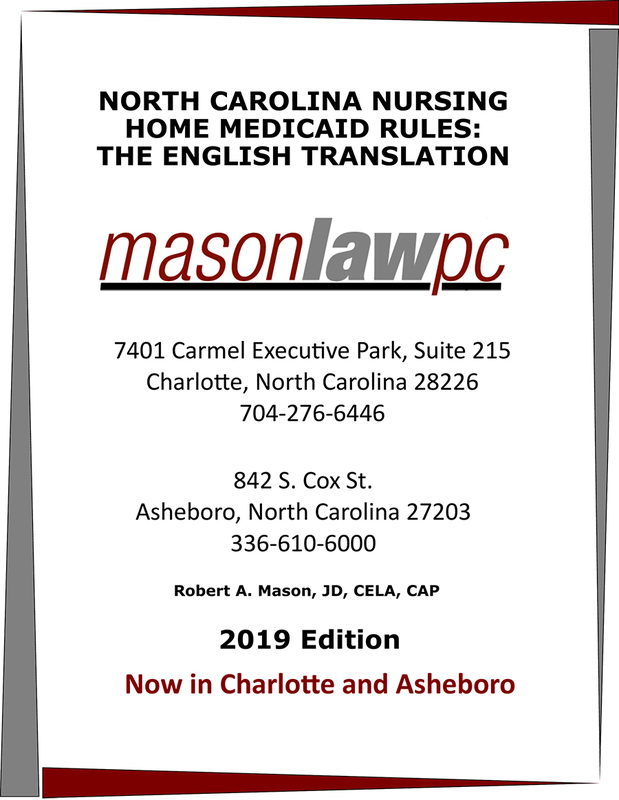 Now, however, in North Carolina the Medicaid application process has routinely become much more difficult. Within a few days of filing a Medicaid application, the county DSS offices are demanding five years of bank statements. FIVE YEARS. That’s 60 months. To top it off, the applicant is usually given about 12 business days to comply (limited extensions can be granted) or the application will be denied. Many banks will have online access to account statements, but often for a limited time (say, two years). To add insult to injury, one bank (which bank shall remain unnamed) insisted on charging $800 to retrieve the documents. 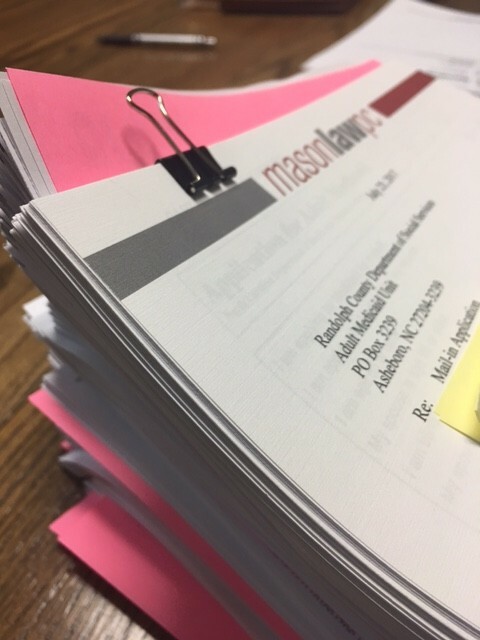 Imagine the difficulty involved in retrieving these documents for an applicant who has moved into the state within the past few years. So far, I have not encountered this situation, but it is bound to happen. In any event, the completed nursing home Medicaid applications are voluminous (or as our president would say, “YUUUGE!”). Caseworkers have also become much more vigilant and suspicious of transfers they may spot on the old banking records. Questions WILL be raised on frequent “Cash” withdrawals or checks payable to Junior. I’ve written about this problem elsewhere. Medicaid restricts transfers of assets for less than the value of the assets. In other words, gifts or partial gifts. The presumption is that a transfer to a family member is a gift. Transfers to reimburse a family member for advances made or to pay for services rendered must be handled very carefully. Four years after the fact, it might be impossible to prove that the $1,000 check payable to Dorothy Daughter was not a gift. If you (or a loved one) might be applying for nursing home Medicaid in the foreseeable future, there are a number of things you should do NOW to help avoid Medicaid grief later. Retain bank statements and other financial records going back FIVE years. If you do not have them, NOW would be a great time to start gathering them. Also, have mercy on your lawyer and keep those financial records reasonably well organized. An added plus: Scanned records are great and take up less room. Do the same with medical records and medical expenses. Again, scanning is great. Document reimbursements. The best bet is to have a simple reimbursement agreement in place. Example: Mother agrees in writing to reimburse Daughter for expenses she incurs taking care of Mother. If you (particularly a parent) are advancing cash to someone (particularly a child), get a promissory note in place. If you intend to pay someone for care or other services (particularly a parent paying a child) get it all into a Service Agreement. If you don’t, it’ll be a gift subject to Medicaid transfer sanctions. Does all this mean you might have to engage me (or one of my colleagues)? Perhaps. It may even be smart. The legal fees will far outweigh the potential Medicaid grief later. It is so easy to make some unwitting Medicaid application mistake years in advance. If a nursing home stay is on the horizon and you have any concerns about asset protection (saving the house, saving other assets) please get help. It may be a bit expensive, but with a nursing home bill cracking along at $9,000 a month a knowledgeable attorney might be a great bargain. Finally, if a nursing home stay is immediately at hand, get help. The Medicaid application process is not for the faint of heart and full of potential traps. PS Most Medicaid DSS caseworkers are very nice people. Some are even friends of mine. But they have a job to do. And they’ll do it. Valuable timely information. It is never too early to plan. My parents are both Vets and my Mom has alzheimer’s. My Dad is going through the process of applying for Medicaid. They have questioned him about his timeshares. He passed them over to me a few months ago. He did not make any profit of off the timeshare, but they are talking about the value of the timeshares? He passed them onto me because he could not afford them any more nor could he use them. We are also having a problem understanding the Aid and Assist Program. He is under the assumption that he has to pass over any money he has to an advocate that will pay his bills? Thank you for your help. They live in New Bern and I live down in South Carolina so its hard to help them with this. I cannot give detailed legal advice in a comm box – for that you’ll need to make an appointment with an attorney. That being said, Medicaid is attempting to determine whether to apply a transfer sanction/penalty based upon the value of the timeshare because he passed it to you as a gift (you didn’t pay for it)./ Unfortunately time shares are very difficult to value. As far as VA Aid & Attendance goes, if the VA believes your parents are incapable of managing their VA benefits, they will insist on appointing someone (who could very well be you) to manage their benefits and insure that the benefits are being used for their welfare only).